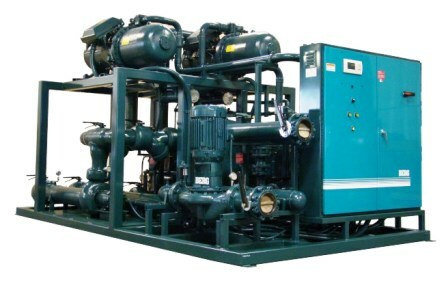 Berg Chilling Systems’ industrial water cooled chiller packages have a choice of semi-hermetic refrigeration compressors, scroll refrigeration compressors or screw refrigeration compressors with a double pump tank mounted with the chiller module, plus the advantage of being able to reclaim waste heat. 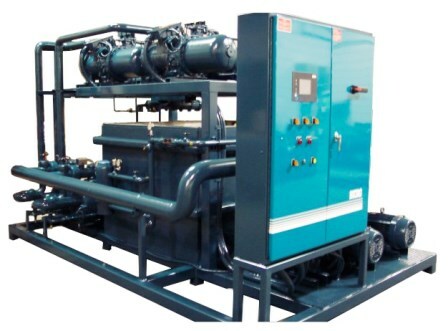 All Berg water chiller systems are fully tested under actual load conditions before being shipped. 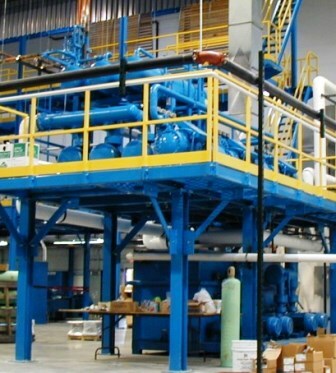 These self-contained water-cooled industrial process cooling systems include both a water chiller and a double pump tank system for a complete industrial cooling solution. 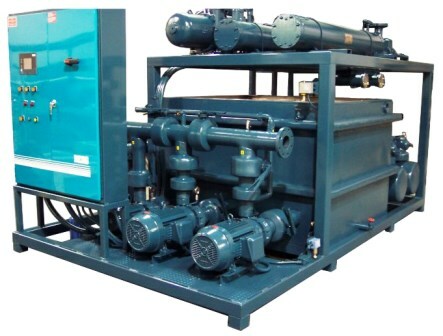 This water cooled chiller comes pre-piped and pre-wired and requires a minimum of installation effort and occupies a small amount of floor space. 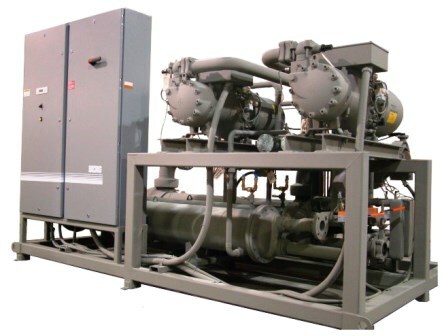 Berg Chilling Systems Inc. has a long history of delivering high quality and reliable industrial chiller packages for a variety of industrial and commercial applications. 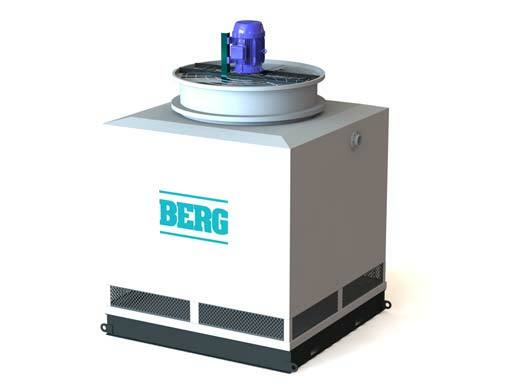 Working with Berg allows you to benefit from our extensive experience acquired from hundreds of installations in all types of conditions all over the world. 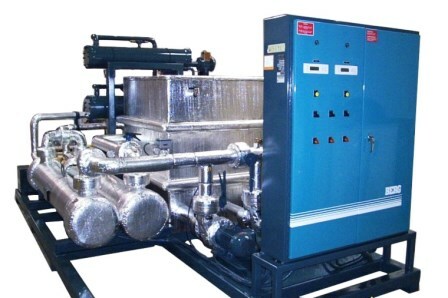 As the heated process fluid passes over the evaporator some of the heat contained in the fluid (process chillers use water for the medium instead of air) is absorbed into it. The refrigerant inside the evaporator coil, originating from the condenser, has been metered causing a pressure drop of the refrigerant. The process of the metering of the refrigerant and resulting pressure drop causes the temperature of the refrigerant to drop. This causes the evaporator to be cooler than the air. As more warmer air passes over the evaporator coil the heat from the process fluid is absorbed into the coil and refrigerant, which is partially a liquid. This heat transfer, from the process fluid, to the coils, to the refrigerant, causes the refrigerant to boil and turn into a vapor. The vapor leaves the evaporator coil and is pulled towards the compressor. The vapor enters the compressor where it is compressed. This compression process raises the temperature and pressure of the refrigerant where it is discharged into the condenser coils. Again using water being pulled through the coils, another heat exchange process occurs. This time the heat picked up from the evaporator coils is rejected to the water. As the temperature of the refrigerant drops it once again becomes a liquid and is pumped back towards the metering device usually located near the evaporator coils where it will begin the process of absorbing heat from the evaporator all over again.